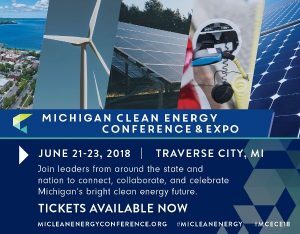 NMC will host and co-sponsor the Michigan Clean Energy Conference and Expo at the Hagerty Center and Aero Park campus June 21-23. Local speakers including NMC VP Marguerite Cotto and Tim Pulliam, who co-founded Keen Energy Solutions with former NMC instructor Steve Morse, will join headliners Ken Davies, director of renewable energy for Microsoft (and who also started Google’s renewables program) and Al Hildreth, General Motors global manager of energy efficiency. The panelists range from industrial energy auditors to advocates providing net-zero energy home solutions to people of low and middle income. Students will receive a 50% discount on tickets.